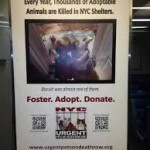 Update May 2013: Thanks to generous supporters, URGENT has ads on the Metro North and LIRR! HELP URGENT RAISE AWARENESS! Please consider donating at least one dollar (or more) to keep the campaign going. DONATE HERE! My wish is for a future with no “euth lists.” If you’re a regular on these pages, I know you share this goal as well. It is possible and achievable – but we need to recruit more fosters and adopters. Our Urgent family is strong and growing, but the dogs and cats of the NYC AC&C need more exposure and they need it now. In 2013, we rolled out an awareness campaign in the NYC transit system. With an average weekday ridership of over 8 million people, exposure to transit riders could lead to thousands more adopted pets. We’re asking all of our friends to donate at least one dollar or more–if everyone contributes, we will have the funds to continue alerting the public about the crisis at the NYC AC&C. For everyone who has been wishing and asking how they can help, here is an opportunity to really make a difference. Please consider a donation to Urgent, a 501c3 non-profit charitable donation now, as a year end tax deduction, as a holiday gift in someone’s honor, and ask your employer about their matching program. Your contributions are tax deductible and 100% will go towards rolling out media campaigns in the tri-state area. Next Post: URGENT In The News! « Previous: Urgent Helps Reunite Dog Missing in the Wake of Sandy!